Our faithful 300s readers know that we’ve got you covered on any and all things Patriots this week, both on the field and off, leading up to Sunday’s big game. 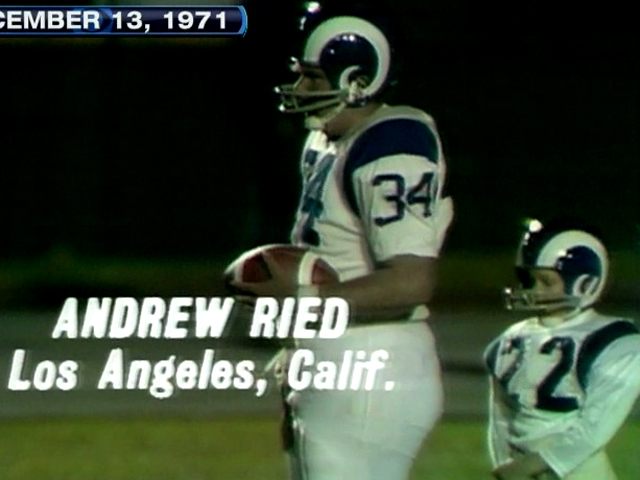 But this one has nothing to do with the upcoming AFC Championship; rather, we’re going to take a trip back in time to a “Monday Night Football” showdown between the Rams and Washington in 1971, when current Chiefs head coach Andy Reid was but a mere 13-year-old lad. But, you see, Reid wasn’t just any 13 year old; he was an absolute freaking BEHEMOTH who probably went on packy runs for his friends before he was even allowed to drive. He legitimately had an entire foot and a half on all of his fellow “peers” in line behind him along with a solid 75 bills. Not only that, but no young adolescent should be able to chuck the ball over a quarter of the way down the field. Ever. It’s not surprising to find out that Reid went on to become an offensive tackle for BYU just seven years later and then went on to serve as a college offensive line coach for over a decade, before breaking into the NFL as an assistant with the Packers in the early ’90s. Reid has had a pretty impressive NFL coaching career that has spanned over two and a half decades, which is no easy feat. But his most noteworthy football moment of his life actually occurred before he even took the SATs. This entry was posted in NFL and tagged Andy Reid, Andy Reid Punt Pass Kick, Andy Reid Teenager, NFL, NFL Head Coaches. Bookmark the permalink. That video is incredible! Reid hit his growth spurt early. True. And I wasn’t aware that Reid played O-line at BYU. Reid is built for the o-line, no question.